The unproven concept that Russian intelligence directly attack American election systems in 2016 keeps being repeated as fact in the media. The details are either shallow or classified. 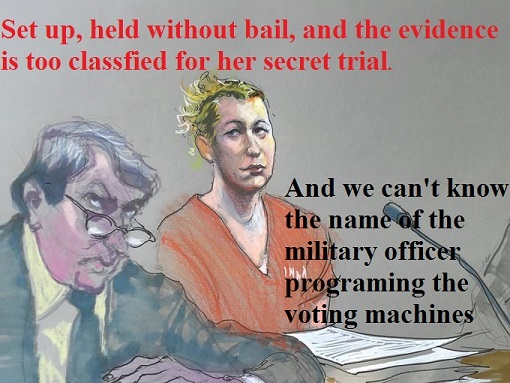 One person, Air Force Veteran and private contractor Reality Winner, remains held without bail still awaiting trial for leaking a single memo on the subject to The Intercept. Meanwhile the Trump Administration has directed the National Guard to protect the integrity of the vote. This directive a grasp for direct military control over elections and West Virginia, along with Reality Winner's defense strategy proves it. Every aspect of military defense of elections is classified. This causes cognitive dissonance when one realizes that the actual hardware is easily hackable and the mechanisms of voter registration are in the public domain. The weaknesses in the voter registration systems are glaring, and one of the worst weakness was exposed by this author years ago. The classified memo released to the Intercept by Reality Winner and included at the bottom of this article, details a purported attempt by the Russians to use a 20 year old hacking technique that would not work anyone with the slightest knowledge to gain access. As Ms Winner awaits trial, unnamed intelligence agencies have state that the attempts happened in 21 states: Alabama, Alaska, Arizona, California, Colorado, Connecticut, Delaware, Florida, Illinois, Iowa, Maryland, Minnesota, North Dakota, Ohio, Oregon, Oklahoma, Pennsylvania, Texas, Virginia, Washington and Wisconsin. Of these States, only Wisconsin had any voting irregularities. West Virginia is not on this list. In West Virginia, the Governor's office has detailed a single National Guard person to protect the election. This person's name, rank, unit and qualifications are classified according to multiple mainstream press sources. This person, who is not accountable like county or state Board of Election officials, has hardware level access to every voting system in West Virginia by order of the President and the Governor. This makes the entire election a military secret based on a secret allegation without proof. The government has moved to quash Reality Winner's subpoenas for the actual records of attacks on the 21 states, claiming State Secrets Privilege. That means that even the judge can not view the evidence she may have for her defense. At the same time an unnamed Nation Guard officer has need to know clearance for the same information. Reality Winner's defense team has also sought subpoenas for 11 companies. One of those, Motherboard, is a media operation owned by Vice Magazine. One wonders what classified information a media operation has that it has not released. Out of the remaining ten companies, only four are actual intelligence contractors. Two of them, ThreatConnect and Veloxcity, have some connection to the investigation of what is collectively known as the DNC Hacks. The other two, Crowdstrike and Fireeye, worked directly for the DNC and the Clinton Campaign and named the Russians for what was provably an inside job. When asked by the FBI for access to the DNC servers, Crowdstrike and the DNC did not grant the FBI access. Thus evidence of alleged Russian hacking is in the hands of a media outlet and two companies that refuse to turn it over to the FBI, yet it is too classified to be used in the trial of a woman who is alleged to have leaked information about a failed Russian Hacking attempt. That attempt, which is too classified for the FBI know about but not too classified for Vice Magazine, is the pretext for military intervention on the next election. That military intervention has been ordered indirectly by the man who is alleged to have benefited from attempts by Russian intelligence to hack into voting and voter registration systems. These hacks are on the level that teenagers would have done using 1990s technology. The core technique was literally Visual Basic embedded in a Word Documents. To counter future failed attempts by the super secret Cozy-Bear teenage strike force, a single national guard officer is behind the firewalls of the voting system in West Virginia. If the Russians did attack, they attacked to benefit a single party. That party has two executive officers that are relevant, a President and a Governor. These men get to appoint a secret person to control the counting of all the votes for a state. The cliché here would be that the cure is worse than the disease, but that cliché is only operative if there was a disease at all. There are few actual facts to support any true narrative, and where those facts are released, they only create more questions at odds with the dominant story. Meanwhile the intelligence community and their lackeys in the federal judiciary are working round the clock to keep the facts and the response classified.